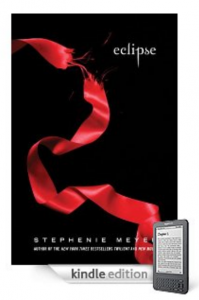 The Edward-Bella-Jacob triangle is in full force in the third installment of Stephenie Meyer’s Twilight Saga: Eclipse. Bella and Edward are applying for college and consider marriage. Bella’s interest in Jacob, the werewolf goes to a new level when she discovers she might be in love with him as well. A major battle erupts in Seattle that leads to a great deal of fighting and bloodshed, and the army is made up of a bunch of newborn vampires. What an image. The battle is fueled by Victoria’s jealousy over Edward and Bella’s relationship. In efforts to avoid spoiling the plot for those of you who haven’t read the book, I will leave it at that. So, grab a copy of Eclipse for your Kindle and Kindle DX and tell us what you think. This review reminds me of my thoughts on Harry Potter. I usually don’t read fantasy, but somehow those books really sucked me in after I finally sat down to read them. It is probably because despite the supernatural element of Twilight and Harry Potter, both series contain issues that we deal with in real life. This entry was posted in Good Kindle Books At A Glance, NYT Best Sellers and tagged Eclipse, romance, Stephenie Meyer, Twilight saga, vampires, werewolves, young adult fiction by holly. Bookmark the permalink. Holly, we get it, you like the Twilight series. But this isn’t a Twilight blog. It’s a kindle blog. One post about it suffices.